The Colbert Report has an occasional segment called “Cheating Death,” which is introduced by the image of Stephen facing the hooded figure of Death over a chessboard. That’s a reference to the 1957 film The Seventh Seal, a medieval morality play written and directed by Ingmar Bergman. Colbert, who switches chess pieces while Death is distracted, parodies the role of a knight who puts his soul on the line to save a few lives during a season of plague. But Bergman wasn’t kidding. Most of his 60-some films, from his 1944 screenwriting debut with the schoolroom drama Torment through his swan song Saraband, released in the U.S. in 2005, were about the plague of the modern soul  the demons and doubts, secrets and lies that men and woman evaded but were forced to confront, to their peril. This agonized Swede was a surgeon who operated on himself. He cut into his own fears, analyzed his failings, perhaps sought forgiveness through art. He may never have found that expiation; he lived his last years alone on remote Faro island, speaking only rarely with his old friends and colleagues. But when he died today at 89, Bergman left behind him a worldwide colony of devotees, and a collection of spare, severe dramas unique in their intensity and impact. Bergman must have been surprised at the acclaim for works so personal, they seemed like primal screams, picking at the scabs of his psyche. “The demons are innumerable, appear at the most inconvenient times and create panic and terror,” he said in a 2001 interview. “But I have learned that if I can master the negative forces and harness them to my chariot, then they can work to my advantage.” Through his unforgiving artistry, the interior monologues of a tortured intellectual achieved an international impact. His films spoke not just to the self-absorption of the therapy generation, but to the human quest to discover the worst and the strongest about ourselves, to make that journey into the darkness with no guide but our need to know. For a good quarter century  beginning with his burst into world movie prominence in the ’50s and extending until his official “retirement” after making Fanny and Alexander in 1982  Bergman defined serious cinema. He earned consecutive Academy Awards for best foreign film in 1961 and 1962 , another in 1984 . Three times, he was Oscar-nominated for best director ; five times, as author of the best original screenplay . The Academy also gave him the Irving G. Thalberg Award for career achievement  the only foreign-language filmmaker to receive it. In 1960 he received a still higher honor: he graced the cover of TIME, the first foreign-language filmmaker to do so since Leni Riefenstahl in 1936. At the time, the foreign films that made an impact with the cognoscenti were mainly from France, Italy and Japan. Bergman, though, was a one-man film movement; his instant eminence created a cottage industry of Bergmania. Janus Films, with U.S. rights to most of his pictures, ran Ingmar Bergman festivals in theaters around the country. Full-length studies of his work appeared in English, French, Swedish. In 1960 Simon & Schuster published a book of four of his screenplays . For a generation of budding cinephiles, that settled it. Film was literature. Movies were art. 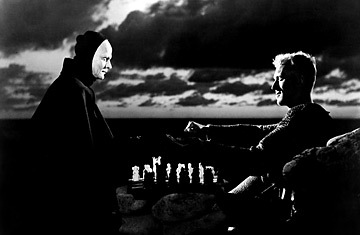 And Bergman was the Shakespeare of the cinema. They certainly launched a generation of film critics, this one included. Dozens of us have the same story of teenage revelation: of seeing a Bergman movie, usually The Seventh Seal, and saying, “This is what I want to study, devote my life to.” Here, we saw, was no mere director, collaborating on scripts with other writers, but a full-service auteur. Except for The Virgin Spring, written by Ulla Isaksson, and The Magic Flute, a faithful rendition of the Mozart opera, all of Bergman’s most famous film stories sprang from his own fertile, febrile brain  from childhood memories and adult adulteries, from his copious trunk of obsessions and grudges.